Upon completion, the I-4 Beyond the Ultimate project will improve motorists’ commutes in a variety of ways. The enhancements don’t end at rebuilding nearly 40 miles of roadway, but rather continue with other signature features such as Florida-friendly landscaping, architectural accents and innovative interchanges. This portion of the website highlights how this distinct and memorable design will reinforce mobility and safety, engage communities and maximize accessibility. Four new tolled Express Lanes (two in each direction). Monumental and functional direct-connect ramp pylons. Enhanced bridge architecture and cladding. The I-4 Beyond the Ultimate project will employ some of the latest strategies and technical enhancements in the field of transportation. Innovative interchanges are being constructed in certain places to address unique traffic flow needs. The Diverging Diamond Interchange (DDI) is a type of diamond interchange in which the two directions of traffic at an interchange cross to the opposite side on both sides of the bridge. A DDI eliminates several traffic conflict points by moving drivers to the side of the road where they can turn left without having to cross in front of oncoming traffic. DDIs are planned for the County Road (C.R.) 532, Daryl Carter Parkway, C.R. 46A and State Road (S.R.) 472, S.R. 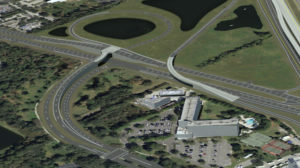 482 (Sand Lake Road) and Lake Mary Boulevard interchanges. An Echelon Interchange is designed to assist in regulating traffic by elevating an approach on both arterial and cross streets to promote freer flow of traffic. The other approach intersects at grade. There are generally only two traffic signal phases, which means motorists should have a shorter wait time than at a typical at-grade crossing. 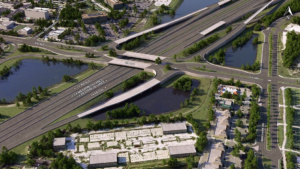 Two Echelon Interchanges are planned for Apopka Vineland Road (S.R. 535): at Hotel Plaza Boulevard and Vineland Road. 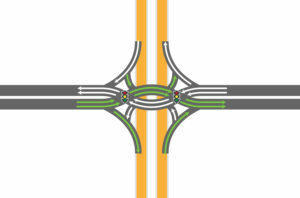 A Diamond Interchange U-turn is a configuration that allows drivers traveling on a one-way frontage road to U-turn onto an opposite direction frontage road without waiting at a traffic signal. The frontage roads along with the U-turns will reduce weaving without compromising traffic flow. A Diamond Interchange U-turn is planned for U.S. 27. A mid-block U-turn is a configuration that reduces overall conflict points at an intersection and no left-turn conflicts by establishing a U-turn at a median near the intersection. Mid-block U-turns will replace the left turns at the intersection of C.R. 46A and Rinehart Road. Sound barriers will reduce noise impacts for residential communities adjacent to the I-4 corridor. The I-4 Beyond the Ultimate project may include construction of sound barriers to help reduce sound between the interstate and adjacent neighborhoods. Many factors determine sound barrier locations. The Florida Department of Transportation (FDOT) is conducting multiple noise studies for the 40-mile project. Based upon the completed noise studies, construction of sound barriers will be considered for residential communities and business districts adjacent to I-4. When is a Noise Study Needed? A new highway alignment is built. The number of through traffic lanes is increased. Sound barriers will feature region-specific aesthetics to reinforce the sense of community. The project adds new Express Lanes and completely rebuilds the existing general use lanes. Traffic studies will predict future traffic noise volumes with the expansion of I-4. 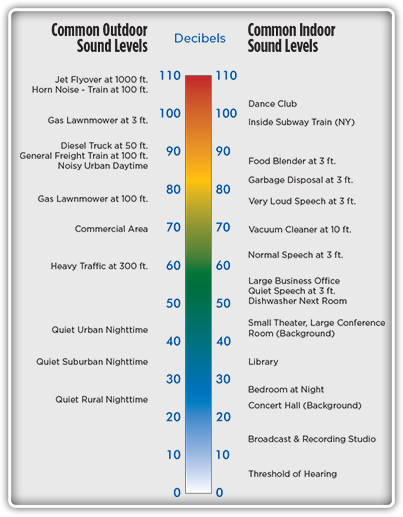 Areas predicted to experience future noise levels of 66 decibels or more will be evaluated for feasibility and cost reasonableness. Additional analysis is done during design. 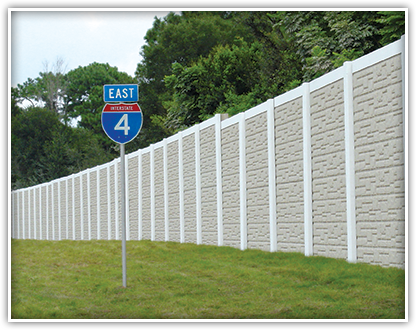 Sound barriers are solid obstructions built between the highway and homes along a highway. They do not completely block all noise. They only reduce overall noise levels. Sound barriers are not built to block views of traffic from homes. What Will a Sound Barrier Do? Distance of the property from the barrier. Distance of the noise source from the barrier. Length and height of a barrier. Elevation differences among the road, barrier and residences. Both FHWA and FDOT require that a sound barrier reduce traffic noise by at least five decibels to be considered feasible. Another FDOT requirement is that the cost per property to build a sound barrier is $42,000 or less. Meeting this requirement makes it cost reasonable. If a sound barrier is determined to be both feasible and cost reasonable, the property owners that would benefit from the barrier are asked to provide input on the proposed barrier. If you’re traveling eastbound or westbound on Interstate 4 (I-4) from Polk to Volusia counties, you’ll notice a consistent theme. 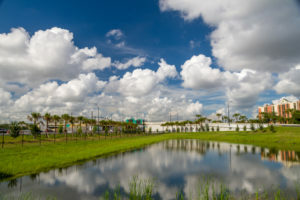 The aesthetics and functionality of the I-4 Ultimate project will seamlessly connect to and from the I-4 Beyond the Ultimate project. As the I-4 Ultimate project finalizes construction activity in 2021 from Longwood to near Universal Studios, the I-4 Beyond the Ultimate project will continue transforming the roadways to the north and south. Tolling gantries, lighting, signage, bridge aesthetics and other features will look thematically similar throughout the limits of both projects to better visually connect the roadway and give a cohesive feel for motorists. Large pylons — similar to the ones visible near the Ivanhoe Boulevard interchange — will signal motorists toward Express Lane entrance and exit points throughout both projects. Different interchanges and bridges will have different options for aesthetic treatments. There are basic options and other enhanced aesthetic options available that may be decided upon and maintained by a county or municipality. 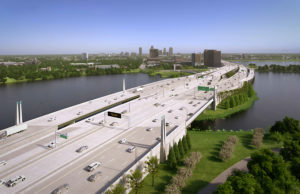 In addition to fostering a similar look to the I-4 Ultimate project, the I-4 Beyond the Ultimate project aims to create a familiar feel throughout its length. Express Lanes separated by concrete barrier wall, widened sidewalks adjacent to certain roadways or direct connect ramps all will be used on both the I-4 Beyond the Ultimate and I-4 Ultimate projects. Just like the I-4 Ultimate project, the I-4 Beyond the Ultimate project will result in six total general use lanes — with auxiliary lanes in some spots — and four total Express Lanes. 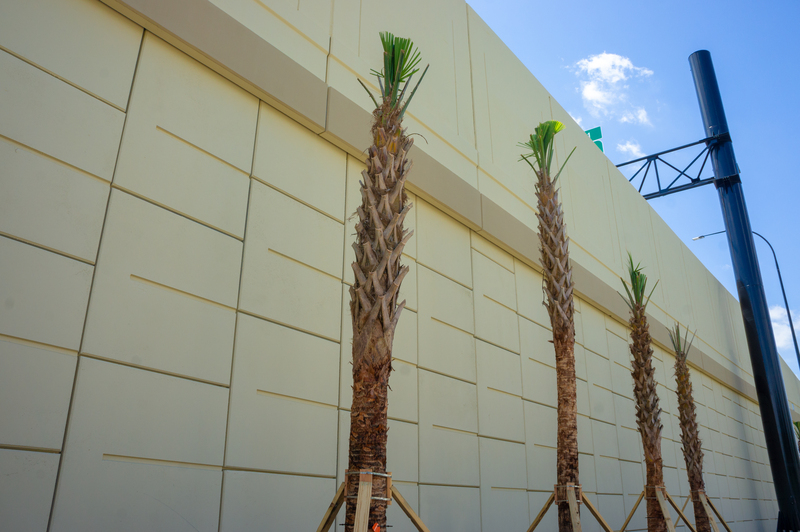 Landscaping will be implemented after completion of the different segments of the project, and it will include Florida-friendly and native plants to help reduce maintenance and preserve a signature Floridian feel for all motorists.